“Musically, it is somewhat uneven. The piece is tonal and at times reasonably lyrical, but there are no memorable tunes. However, there is some brilliant orchestration work which, alongside the stunning tenor voice of Nicholas Sharratt as the Lamplighter, renders the opening to acts 1 and 3 deeply atmospheric and spine chilling. This is Opera North on top form, both from a performer and orchestral point of view. 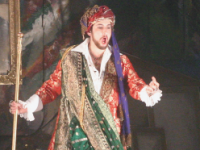 Along side the aforementioned Nicholas Sharratt, Paul Nilon also possesses a fine tenor voice and proves his worth as an actor with his excellent portrayal of the artist Chartkov. An excellent performance is also given by Richard Burkhard as Chartkov’s servant Nikita.